Across from the Union League Sansom Street takes on the image of a back alley, with a maze of dumpsters lining the street between Broad and 15th. On Thursday, April 17th we called SWEEPS, a section of the Sanitation Division, to report these dumpsters on Sansom Street blocking the sidewalk and using a parking space. We'll see if it generates any positive results! SWEEPS stands for Streets and Walkways Education and Enforcemnet Program, whose purpose is to enforce the sanitation code, can be reached at 215-685-4275. The person answering the phone was very helpful and pledged to send someone out to take photos. Let's see what happens! Called SWEEPS again on Monday, April 21st. message taken and "will be given to the SWEEPS supervisor." 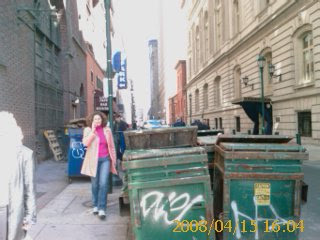 These dumpsters appear to belong to 1424 Chestnut Street, and sit in front of 1441 Sansom Street.